There are several typically compelling U.S. 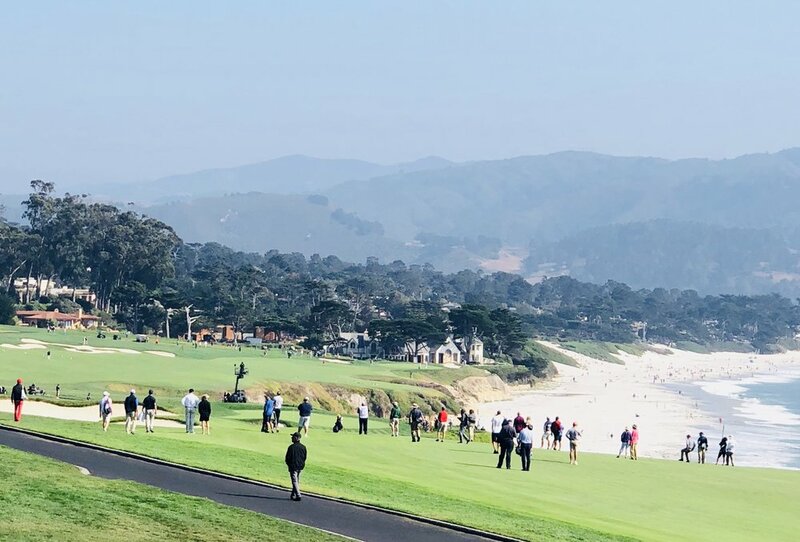 Amateur stories to follow, particularly at sun-splashed Pebble Beach Golf Links. Ron Driscoll at the official site has a perfect roundup of the close Round of 16 action and a quarterfinal preview. Mike Trostel with more on the players who all earned exemptions to next year's Amateur at Pinehurst. The lead quarterfinal match at 2:30 pm PT and features Davis Riley v. Devon Bling. Brentley Romine at Golfweek has the Riley angle, while I penned this story on Bling's recent rise and play for his late mother. Both are playing well and for a lot, so it should be a good one. Ryan Lavner reports on Isaiah Salinda's win over former US Mid-Amateur champion Stewart Hagestad. Salinda cracked a driver head but helpful technicians on hand were there to help with a replacement. Stanford's Salinda recently won the Pacific Coast Amateur and is from South San Francisco. Lavner reports on the unfortunate round of 32 loss by Akshay Batia thanks to a mistake ride taken by his caddie from what he thought was a rules official. Mercifully, the Riley-Bling match starts off the afternoon and should finish inside Fox Sports 1's allotted broadcast window. The network signed off on Thursday's action with two matches All Square to rack up a tape of some sort of U.S. Women's Open mini-documentary. I'm told an on-time sign off with action still going also occurred Wednesday. So to recap: do you go with prime time match play golf from Pebble Beach or save an hour of overtime pay? Fox execs went the save-money route for their USGA partners. It's little wonder then that fans do not make an effort to find USGA-Fox broadcasts. Overnight ratings for Thursday's Round of 16 coverage were down 29% from last year's Thursday play at Riviera, drawing a .05 despite the prime time slot and Pebble Beach. The quarterfinal matches starting late in the day for Fox. Today's coverage on FS1 starts at 4 pm PT.